Alzheimer’s Association,???? ?2242 W. Holcombe Blvd., Houston, TX 77030. Bank Day will take place in the store front on the first floor. 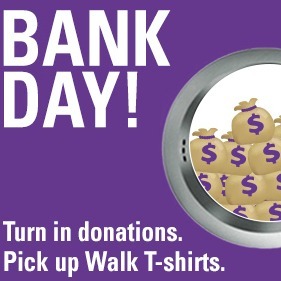 Tuesday, October 22 from 7:30 a.m. – 7:00 p.m.
Save time on Walk Day by dropping off any checks or cash donations you’ve received, or pick up Walk T-Shirts. Don’t Forget – For every $100 raised by your team collectively, you’ll receive a T-Shirt (no more than the number of team members). 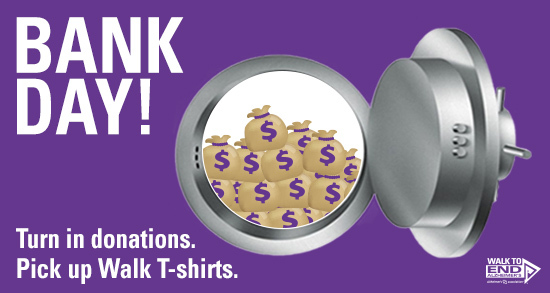 If you have individually fundraised over $100 you are only eligible to receive 1 Walk T-Shirt. Please contact Rasheeda at 713-314-1340 or???? 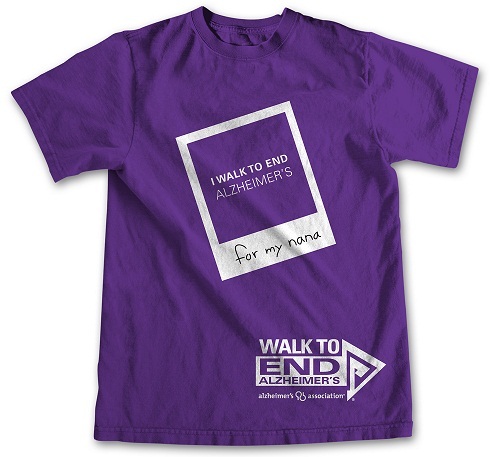 ?rdaugherty@alz.org for more information.????? May 22, 2013 AlzTex Admin Comments Off on Ready…Set…Go FUNDRAISE! Walk to End Alzheimer’s 2012!